Gavin is 10 years old and he’s living with a Mitochondrial disorder, Epilepsy, an MECP2 mutation, and Autism. 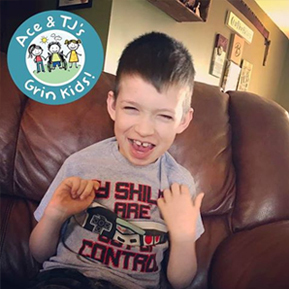 He’s one of our newest 2017 Grin Kids! Gavin loves to rock in his rocking chair, swing, and snack on everything! He LOVES Mickey Mouse and all of his songs so this trip is going to be EXTRA special… We’re taking Gavin & his family to Disney World in just a few months! Get ready Gavin! If you’d like to help support Gavin’s trip, click the link below!